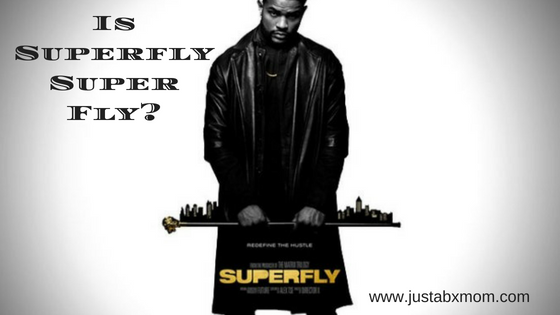 Is The New Superfly Movie Super Fly??? We were invited to attend the screening as media. As always all opinions are honest and ours. The original Superfly movie came out in 1972 (a good seven years before I was born). It was part of the Blaxploitation era. What is Blaxploitation? The original Superfly took this to a whole new level by making the movie’s protagonist a drug dealer. This wasn’t some hero coming into the hood trying to stop the crime. He was the crime! My dad remembers going to see this film when he was a teen and so when given the opportunity to see the new film at an advance screening I thought it made sense that he was the one to attend. Before heading to the theater he kept telling me that if the new film was going to be a success it would have to have an amazing soundtrack because that was one of the things that people still remember from the original. I might not have seen the first film but when I checked out the soundtrack I definitely knew a bunch of those songs and I’m betting you will too. My dad also pointed out that the clothing was impeccable in the original. You see, Blaxploitation movies made it a point to always include a soundtrack that could stand alone as well as including fashion that would make the movie stand out from another action flick just telling a story. I am happy to report that the new version of Superfly from Sony Pictures includes a really good soundtrack. My dad said the new soundtrack like the original did a wonderful job of moving the movie along. There was also lots of action and violence. My dad really likes movies with action and violence. Some of my friends don’t. Me? It depends on how it is done. I had a few friends at the screening along with my dad that said it felt a little too intense at times for them. My dad said it was reminiscent of the original and very well done. He also said while fashion has changed this modern take on the movie still had a fantastic wardrobe. Including a gang that wears all white and carries white guns! The action has been moved from the streets of Harlem down to Atlanta but that just gives a new feel to the movie. Harlem was almost a character of it’s own in the original and now that star has been replaced by Atlanta. This remake had big shoes to fill and it seems like it might be the thing to bring back a genre that we haven’t seen in a while. Great review! I stay in Atlanta, and the other day there was a huge red carpet event for this movie. I haven’t seen the original, however it’s good to know that the remake succeeded your expectations. I’m unsure if I’m going to see this movie since I don’t like drugs and violence. If you don’t involve excessive violence in movies then it probably won’t be for you. I definitely don’t think it would be good for a family movie night but it delivers exactly what it advertises.